Washington, DC: US Secretary of State Rex W. Tillerson Tillerson met Russian Foreign Minister Sergey Lavrov, here on 10 May and discussed the importance of defeating ISIS, de-escalating the violence in Syria, and ensuring that humanitarian assistance reaches hundreds of thousands of civilians throughout the country. The discussions between the US Secretary and Russian Foreign Minister covering a range of issues including Ukraine, Syria, and bilateral concerns lasted more than an hour. 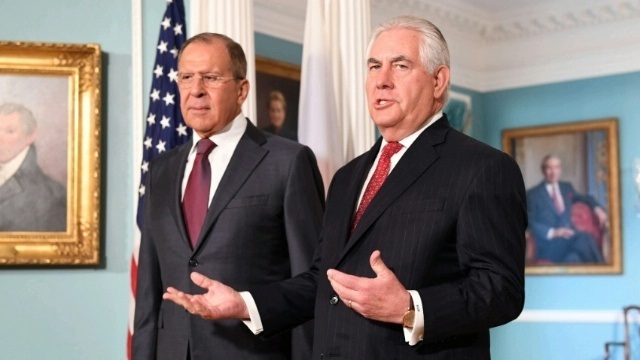 During this meeting, both the US Secretary and Russian Foreign Minister restated support for the UN-led political process in Geneva, which is central to international efforts to bring about an enduring resolution to the conflict. On Ukraine, Tillerson stressed the need for progress toward full implementation of the Minsk agreements. It was underscored by the US that sanctions on Russia will remain in place until Moscow reverses the actions that triggered them.